It's a Fender 1962 American Vintage Reissue Jazzmaster. Pretty much the last one anywhere in the United States that we could find - they've been replaced by the 1965 version that's almost the exact same thing for nearly $1,000 more. Fender's really gotten ridiculous. I was lucky to find this, even though black wasn't my first choice. I'm warming up to it, though. Maybe I'll throw a gold pickguard and black pickup covers on there at some point. I've wanted an American Jazzmaster for seriously like 25 years, ever since I first saw My Bloody Valentine using them (and then pretty much every other favorite band I had in the early 90's). 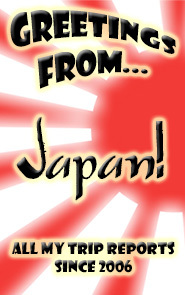 Sure, I've had my Japanese one for almost 6 years now and I love it, but I always wondered what I was missing and had a little bit of an inferiority complex about it. So this is seriously like a dream come true for me. I'll have a lot more on this later, including a big comparison between my Japanese and American Jazzmasters, and a little disappointment I had upon receiving this that's thankfully now been rectified. All that soon! My first post comparing the UK, Thai and Chinese Doc Marten 1460's generated a lot of controversy (and still gets tons of hits) - so much so that I had to turn off the comments, which had veered towards outright racism before I deleted a bunch of them. Some people seemed quite threatened by my conclusion, which was that the then-new line of reissue "Made in England" Doc Martens boots sucked. And they did - I haven't worn my first pair of them in years now, though I do still own them. But I decided to give them another shot with the 25% off year-end sale DM always runs. Part of my problem with my earlier pair was that DM's sizing is wrong. I wear a US size 12, which DM's sizing chart tells me should be equivalent to a UK size 11. But I found my Made in England Docs to be smaller than both my US 12's and my UK 11's from Thailand and China. They still technically fit, but they were a bit tight due to an odd shape that would have required feet shaped like a hockey stick to feel comfortable, and they left no room for me to insert an aftermarket insole, which I found necessary to combat the rock-hard insoles they came with. So this time I went up to a UK size 12, expecting they might be a bit big but knowing I'd have room for a gel insole if needed. That's actually gold foil lettering. DM is obviously trying to go for kind of a premium experience with the Made in England line now - my earlier pair just came in a standard cardboard box with black and yellow stenciled lettering on it. (Sorry, it wasn't even worth keeping, so I didn't get a pic before tossing it.) It was not the same as the totally plain Asian boxes, but it wasn't premium by any stretch. That's a little pamphlet explaining what's different/better about the MIE's and why you want them (basically they are supposed to be better constructed, hand stitched, etc). It also gives some tips on shoe care, which surprisingly don't try to push you into buying DM's own shoe care products. In other words, this is actually kind of useful info. The pamphlet itself is printed on heavy paper and feels more expensive than a simple throwaway leaflet. As soon as I put the boots on, I knew that DM had made major changes to the whole boot. The shape is straighter now - for better or worse (depending on how much of a purist you are), the shape is now very close to the Asian version. Vietnamese on the left, new UK in the middle, old(er) UK on the right. The older UK boot looks almost like it's made for someone with club foot, and trust me, it feels like it too. Btw, those relative sizes are accurate - the back of each boot is on a line, so that's the size difference between an Asian 11, new UK 12 and old UK 11. The insoles are spongier - probably pretty close to the way they were in the old days, and miles better than the concrete slabs they put in my earlier pair of MIE's. The sole itself is also thicker and made of a different rubber that's lighter in color. Old on the left, new on the right. That's neither an illusion nor is it due to wear. I said in my earlier post (or maybe in the comments) that the leather on my original MIE's was thin and hard. But the leather on these new ones is thick, and definitely softer even when new. My old MIE's basically never broke in; I'm still working on these new ones but I'm pretty confident they will. And the leather does definitely feel better than the Thai or Chinese ones. I think these are keepers. I might still put in an insole, but it's actually more for sizing this time - I wish DM made these in half sizes. 11 is too small for me and 12 is just a smidge too big. But the latter is preferable. DM should update their sizing chart, or just make the UK and Asian boots consistent. Size 11 in the Asian version is fine for me. Size 11 in the UK version is torture. I gotta give props to DM, though, for making the other changes they needed to make. I don't follow them that closely so I don't know if any of these things were really publicized, but to me it's immediately obvious how much better the MIE's are now than when they were first reissued. I wonder if they read my earlier post! Closest to furthest, those are my old UK 1460's, Vietnamese 1460's (same as Thai/Chinese), new UK 1460's and Thai cherry red 1490's. My two favorites are the new UK ones and the Thai 1490's - something about the 1490's just feels better built than the other Asian DM's I've had, and they've lasted me about 4 years now (not with daily use - as big as they are, they look kind of clownish if I'm not careful). I hope I don't change my mind again after a few months or a year, but at this point I feel like I've gotta update my original conclusion based on this new evidence and recommend springing for the Made in England DM's now. They're overpriced at $200 (they were originally $180), but if you can get them for $150 like I did, I think they're probably worth it. The Asian DM's are still a pretty good deal at under $100 (with a coupon for shoebuy.com), but I do chew through those things at the rate of about a pair a year for my daily wear black boots. If the new UK ones last me an extra 6 months - and longevity wasn't one of the problems I had with my earlier pair - they'll have paid for themselves. 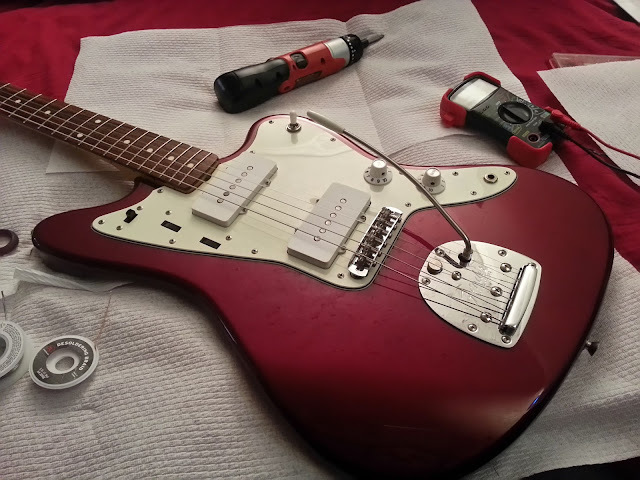 The state of the Jazzmaster, January 2013 - shielding, witch hats and more! It's no surprise to me that my most popular posts all deal with certain pretty specific themes - what's probably more surprising is that I know this yet keep writing about other stuff that only I seem to care about. 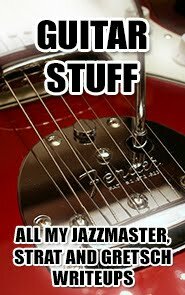 Anyway, over the years I've written a few posts about tinkering with my Japanese Fender Jazzmaster and they still get tons of hits (they're way up in the Google search results). So I figured I'd post a little update on what I've been doing with it lately. 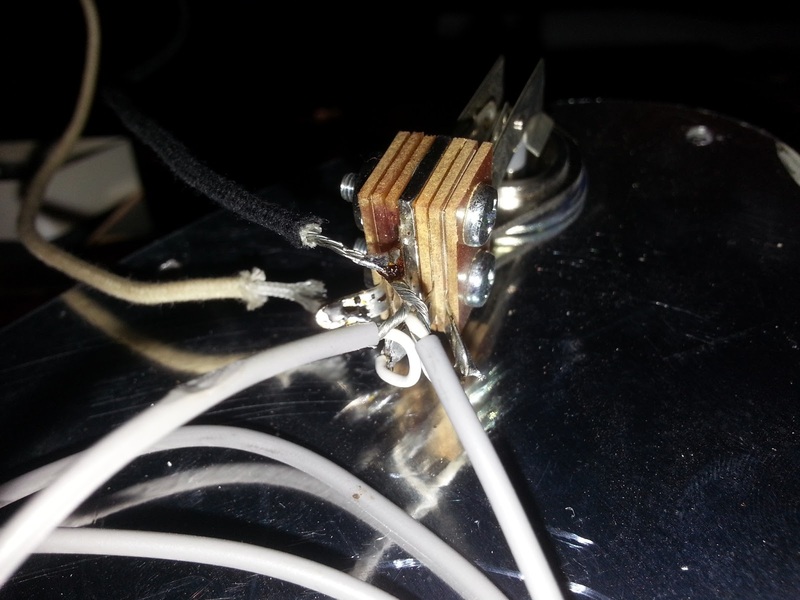 I shielded the entire pickup and control cavity using copper shielding tape. Why? Well, Japanese Jazzmasters ship with some pretty low output pickups - around the 4-5 ohm range. Because of that, they can get away with using black shielding paint rather than a real metal surface (vintage Jazzmasters shipped with solid brass tubs for shielding). This saves on both weight and cost. The soldering iron is in case you need to do anything special with your grounding - I didn't, but some people like to specifically ground the shielding itself (you shouldn't really need to if you apply the tape correctly), or solder each piece of tape together. 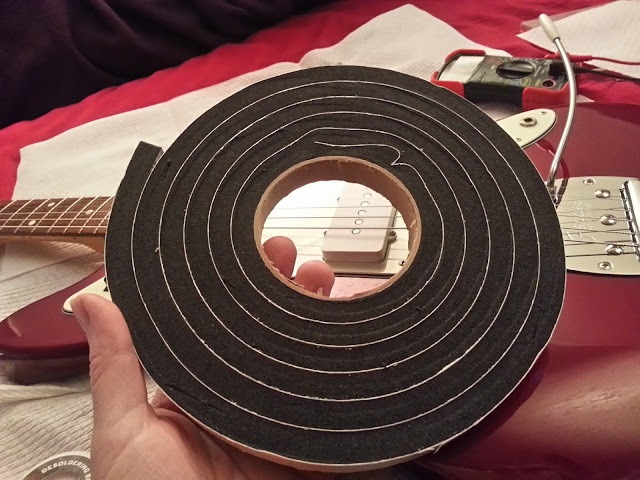 The sandpaper is similarly kind of optional - I used it both to sand down rough spots where the tape wasn't adhering, as well as on my pickup covers (more on that later). The pickup foam you need because you're going to throw out your old foam. The strings are because duh - you're removing your strings to get in there, may as well put on some new ones. And the multimeter's to check for connectivity all around - the tape needs to make a circuit, so the last step of the process is to check all over to make sure every part of it is electrically connected to every other, and it's all grounded. You also need this - conductive copper tape from Stew Mac. The nice thing about this stuff is that the adhesive is conductive, so there's really no need to worry about soldering the tape itself together (as you need to with lesser copper tape). So, does it work? Ehhhh. It's hard to say - it's still a single coil guitar, it's never going to be totally silent in the bridge or neck positions. (It's silent in the center position, where it acts like a humbucker.) I'm a little disappointed that there's about as much hum still as my Squier Strat, which has no shielding at all - not even paint. 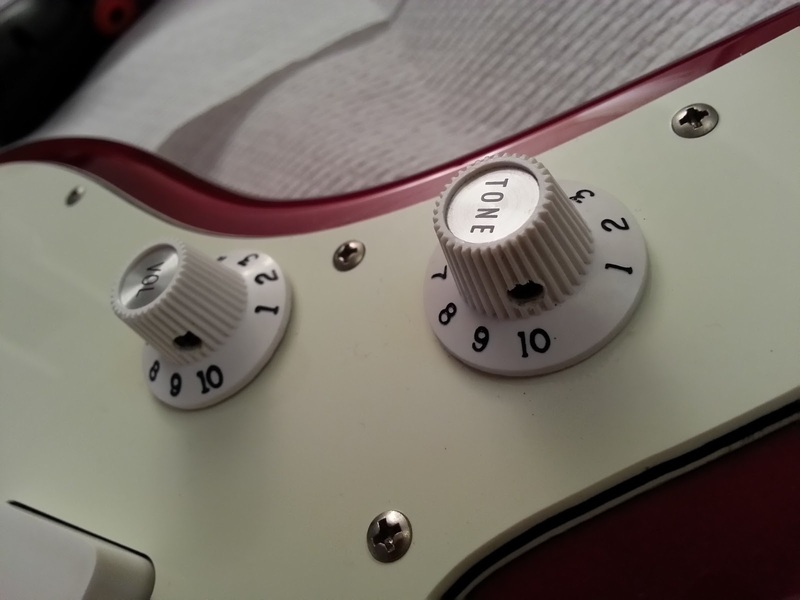 Then again, the Strat has much lower output pickups. The Jazzmaster's always been a hot guitar, output-wise. So what was I doing on this night, with a screwdriver, multimeter, soldering stuff and more pickup foam? I reopened the thing up to check for "cold joints" in my pickup installation to make sure that wasn't the source of my hum. After resoldering one suspicious joint, I'm confident now that everything's tight. That's a bad joint - the black wire's just kind of resting there, with some ugly looking solder holding it on and conducting all the current. Make sure you don't do this. I fixed this by desoldering it, then making a mechanical connection, then resoldering properly. Still have hum in single pickup config, though. Like I said, it's a single coil guitar. This is as good as it's gonna get! 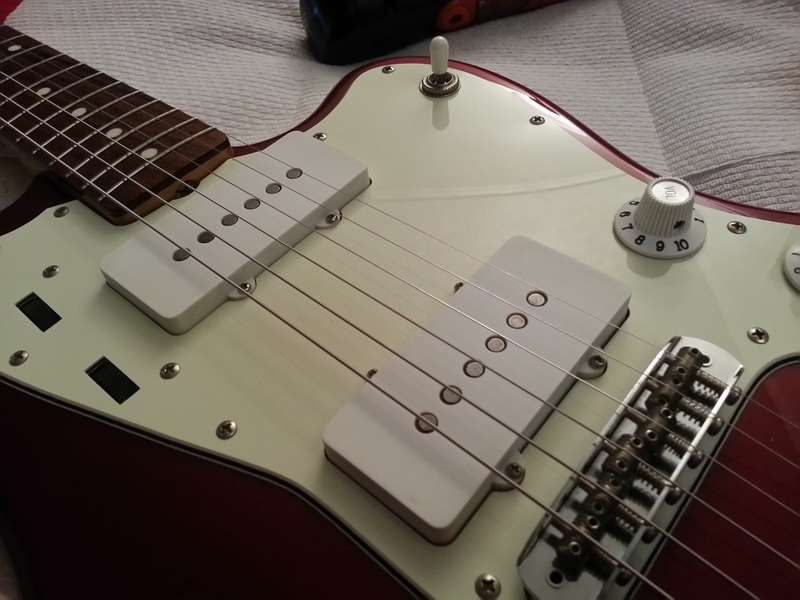 I also wanted to raise my pickups a bit because one other quirk of Japanese Jazzmasters is that the pickup cavities are a little deeper than the American ones, so if you buy American pickups, the foam isn't going to push them out far enough. By the way, check out that label. The official Fender Jazzmaster pickup foam is even listed as "weatherstrip" foam right on the label. If you're a purist about only using Fender foam, forget that - just go to the hardware store and buy some weatherstripping. It's what Leo would have done. That's just high density rubber foam weatherstripping from Home Depot. At half height, when combined with the regular pickup foam, it ends up being perfect to push out the pickups to the required height. Witch hat knobs really should be on any "1966" reissue guitar - Fender Japan doesn't include them because they don't make them in general, and they obviously don't want to make them just for the Jazzmaster. Mine are real Fender new old stock from the 1960's - these are getting really hard to find and aren't that cheap considering they're freakin' KNOBS. You can see that mine are slightly mismatched - I may do something about that sometime, although this is certainly something that might have happened naturally to a real guitar from the 60's. These knobs were just from different batches, and maybe even different years - one came to me still in the original sealed bag (oddly enough, the more discolored "tone" knob - that's real UV aging! ), the other was obtained through a nice guy on the offsetguitars.com forums, and they've aged at slightly different rates. 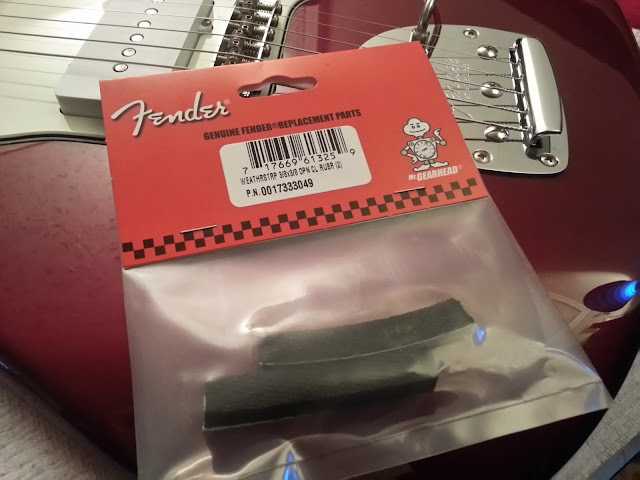 The best way to quick-age old Fender plastic parts is to let them sit in some room temperature (not hot!) tea for a while - I may do that with my volume knob, or I may just leave it because it's not that noticeable, looks like plausible aging and it's just as likely I'd overshoot with the tea method and end up with mismatched knobs anyway. btw, yes, they fit on CIJ/MIJ Jazzmasters, though they don't turn in a perfect circle (they're slightly off-axis) due to the smaller pot shafts. Again, not that noticeable, and you can always change the pots if you want. 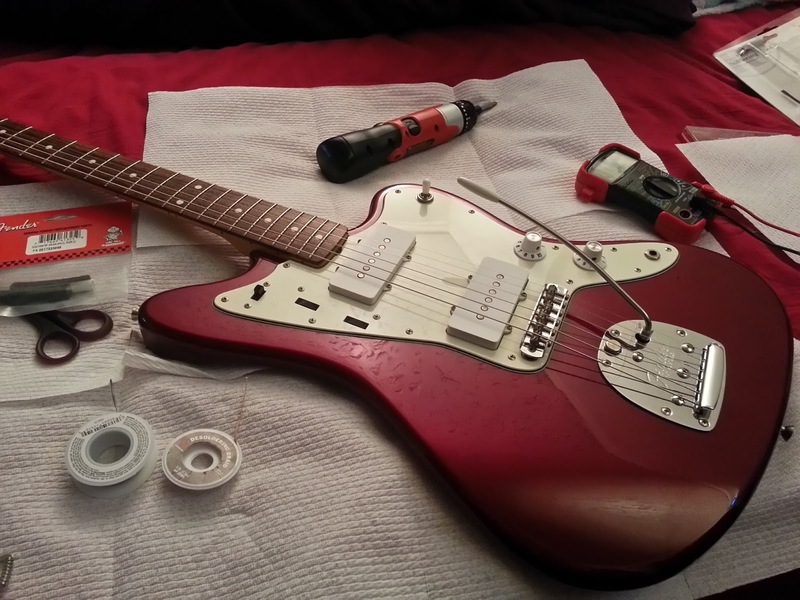 At this point, I'm reaching diminishing returns with anything further I do to this Jazzmaster. About the last thing left is to just replace the remaining wiring and electronics, and I probably will do that sometime - although for me, it's mainly a vanity thing so my knobs turn in a perfect circle and I'll know in my own head that I have wiring "as good" as any American JM. But in terms of sound, playability and even look, I can't imagine how I'm going to improve this thing any further. It's a beautiful looking and sounding guitar (with literally the best neck I have ever seen) and I would 100% gig with it as it is. Now on to fixing up my new Gretsch 5422T! My new PlayStation 3 has arrived, replacing my nearly-dead launch unit. (This is a similar story to mine.) Can't say I'm too excited as I never wanted to replace my original PS3, but since I used to write about video games for a living, I just wanted to give a few thoughts on the newly-redesigned system. I am happy to have a working system again, but, well, this ain't the same PS3 I once knew. This is the Uncharted 3 bundle, which comes with the aforementioned game (that I don't care about) as well as some online game (that I don't care about). I looked for a bare-bones system and surprisingly couldn't find one, which I thought was odd. Most past systems were available both with and without pack-in games at this stage of their... er... "careers", precisely because so many people are replacing dead early units and may already have all the games and accessories they need. So I wasn't too happy about paying for pack-ins. $269 seven years into a console's lifespan is hard to swallow, even with Christmas money paying for most of it. The newest model is definitely not as much of a luxury item as the original 60GB model I have, which felt like a piece of pretty high-end home electronics. The new model definitely feels more like a game console circa 1997, despite Sony's push to make it a trojan horse streaming and gaming appliance (both MS and Sony have the same strategy with their game systems). It's kind of cheap and plasticky, with its manual slide-open, top-loading drive and lightweight casing. It's impossible not to knock it over by inserting a disc or even just hitting the power button unless you hold it steady with your other hand. 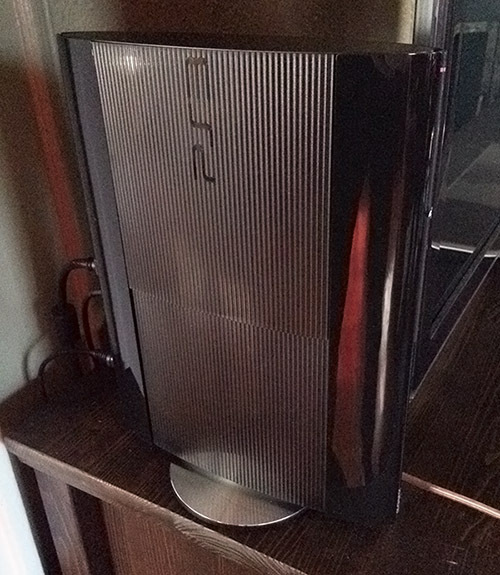 The original PS3 seemed made to stand vertically; the new model seems really ungainly in that position, even with its "stand" that makes it look like you left a compact disc sitting under it when you put the PS3 down. Horizontally, though, it's like the PS1 - you need to have a bunch of empty air above it to insert discs. And obviously, no more backwards compatibility with PS2 games. I didn't use this much but it was nice to know it was there - I still have a ton of PS2 games that I like to think I'll play again (and some, like Rez, that I actually do occasionally). At least I was able to repair my old PS3 to work long enough to transfer my system over. I was glad to be able to get around the copy protection on game saves - wtf is that about?? Even if you're diligent about backing up your PS3 in case of failure, you're going to lose half your save games if your old system ever dies. That was a pretty nerve-wracking 90 minutes, though - I don't know how long my repair's going to last this time (previous one lasted maybe 3 hours of actual use), and I don't know what happens if you turn off one system while transferring... which only starts after formatting the new machine. But luckily, it made it through.